#OccupyVancouver is in the midst of this ambiguous legal gray-zone. Not only is the law’s status ambiguous, given the current court challenge, but so is the wording of the law itself. The relevant section of the Street and Traffic By-Law states that structures can be removed by the city if they are obstructing a “street,” defined as “public road, highway, bridge, viaduct, lane and sidewalk, and any other way normally open to the use of the public.” The art gallery space would have to be defined as a “way” for the law to be applied. But just last week, City manager Penny Ballem stated at a council meeting that the Art Gallery site is in fact under “a completely different set of bylaws.” It is possible that here Ballem was referring to the fact the Art Gallery land is not city-owned land, which according to one UBC Law professor is the reason it is “highly unlikely any level of government will be able to get rid of [the camp].” Either way, the ambiguity is only increased. The same council meeting revealed that the unconstitutional By-Law was cited as grounds to evict hundreds of activists from the Olympic Village Plaza occupation on February 26, 2011. It is for these reasons that the right to tent is absolutely legal and illegal at one and the same time. What does this mean? There is nothing clear, objective or scientific about the right to camp, the right to protest, the right to march (and so on). The experiences of the #occupytogether movement across the world these past two weeks — including last night’s evictions in Chicago, Melbourne and elsewhere — shows that the so-called civil rights we are today offered in contemporary democracies come only on the condition that we do not use them to a maximum. This is why for the police and city managers of Vancouver, every protest is legal up to a point — in so far as the status quo does not change. If our occupation turns its focus towards the local crisis of power in Vancouver, that is when light is cast on these seemingly legal questions, which are in reality only political questions. The By-Law itself is painstakingly opaque, but it is only as hazy as the network of power that presently rules Vancouver. If the occupation begins to add clarity to the situation — if it removes the opacity, if it starts to names names, if it looks at the banks, if it targets the property elite of Vancouver, if it shows the upcoming elections to be a predetermined real-estate scam, etc. — then that is the only true tribunal for the legality or illegality of the camp. The il/legality of the structures bylaw is decided by whether we turn to the question of how the 1% reproduces itself in Vancouver. Nothing else will determine the use of the Structures By-Law, or any other arbitrary law like it. If we stay away from those local questions, we will be safe and the city will wait for the weather to beat us out (Vancouver’s 1% may even pretend to approve). But as the 5,000 people showed on October 15th, and again yesterday, #occupyvancouver is not just a protest in solidarity with occupations on Wall Street and other mass convergences throughout the world. It is a protest squarely situated within the political conjuncture of Vancouver and its unique situation — uniquely deplorable, that is. For here and for us, there is no worse system than the one we are in. First, the Wall Street bailouts were precisely replicated in Canada. Without even minor adjustments to the American model, the Canadian banks were bailed out a total of $125 billion in 2008, representing the same scale and purpose as the US bailout. Second, these bailouts were not in any mix of sectors, but rather housing, in the form of a massive purchase of unstable mortgages and other toxic paper held by the private banks. Anything to buoy the monopoly housing prices of Canada — and above all, Vancouver’s oligopoly. Save the rich at any cost. In a city where every single day we pay more than half our income to landlords and property developers, nothing could be more political than camping in the public/private grey-zone of the VAG, surrounded by RBC, TD and CIBC, and the others banks that coordinate the profit-rate of the real-estate industry. The past decade has seen Canadian banks secure a profit rate of 23%, and there is no way to ignore that the only other sector in the country with a higher rate of profit is Vancouver’s development oligopoly. At an average profit rate of 25%, the industry squeezes rents from Vancouverites like an insatiable parasite determined to make us work to a breaking point — if not leave the city altogether. Third, after ten years of neoliberal reforms, an unprecedented amount of wealth has been transferred to the rich from working-class and low-income people in British Columbia. Today the upper 20% of BC pay a lower tax rate than the remaining 80%, and the provincial government now collects more revenues from sales taxes than from income tax. Over the past decade, B.C.’s corporate income tax rate was cut from 16.5 percent to 10 percent. All of these changes represent a massive handout to the rich, and post-Olympic Vancouver is only an extreme instance of the trend, now hosting the lowest corporate taxes in the world according to global financial auditor KPMG. It was only last year that Mayor Robertson stated, “we have the advantage of an extremely competitive tax regime here. Within a few years we’ll be the lowest corporate tax rate combined in the G8.” Like a 5-year Soviet plan accomplished in four, the Mayor’s long-term goal has become reality years in advance. Take that New York! The result has been the widespread impoverishment of all besides the rich. The surge in homelessness of the last decade has met the strict regulation of the streets to maintain a semblance of public order, with the poor targeted by increased ticketing quotas and swept into substandard temporary shelters — all implemented with a tool-box that includes the Structures By-Law. Before it was even passed by city council, the By-law was cited as grounds to evict hundreds of activists and homeless from the Olympic Village Plaza occupation on February 26, 2011, protesting the sell-off of promised social housing. Since then, the arbitrary law has only been entrenched, appended with even higher fines. My tent at the Vancouver Art Gallery is under the same threat of displacement as the tent of the person sleeping under the Georgia Viaduct. We are tenting in solidarity to assert the right to space and the right to shelter in opposition to the no tenting by-law; and in solidarity with poor and working poor who are impacted daily by the class war waged by developers and the politicians who toe the party line. When a global economic crisis is prolonged by an economic elite as a means to re-accumulate capital and consolidate their hold over every inch of the globe, the only solution is to bring the crisis home. However messy, disorganized, unfocused and patriarchal #occupyvancouver is at times, we should not be immediately discouraged. Resistance is not a thing — ossified, structured or statist — but a radiant struggle situated squarely in everyday life, moving along new subjective lines at a distance from stifling mechanisms of representation, formality, or even at times the deliberations of consensus. While consensus is important, so far each General Assembly has been unable to propose a greater project of resistance than the self-fulfillment of the empty forms of democracy itself. The question is how to respect each other while avoiding a mere simulacra of democracy. In a city of Rent and all-too-many hours of minimum wage labour, the working poor and activists of Vancouver do not have the sheer time to spend debating whether the General Assembly should revise the incidental minutiae of its process at every single meeting, or whatever other proposal is presented in order to defer the radical potential of the occupation. What is necessary is to find ways to sustain running battles with power, wealth and privilege from each direction. As the student occupations during the past two years have shown, including the more sustained protests in Madrid, Tahir Square and Greece, the #occupytogether movement is a new model for the commune of the present. Here, politics is neither a projection into the future nor an ‘organic’ substance, or even a spontaneous manifestation that may or may not arrive on the horizon. Rather it is a collective, lived experience organized around a number of principles, taking place within liberated spaces. From the perspective of the police and the city-state, one has to understand that any reason within their arsenal will be given to order an eviction. So far the VPD have issued a warning while incessantly encircling the camp with their multi-million dollar budget: they will not close the site unless ordered to do so. The “unless” is key, since the police are the physical embodiment of the larger state of exception and may mobilize any excuse to justify an eviction: sanitation problems, a few anarchists or bolsheviks, complaints by the rich huddled in the comfort of their Hotel Georgia penthouse, or whatever else you may think of. When the order is given to maintain the status quo of the ruling elite, whether it be the removal of #occupyvancouver from its home at the Vancouver Art Gallery or otherwise, there should be no illusions. 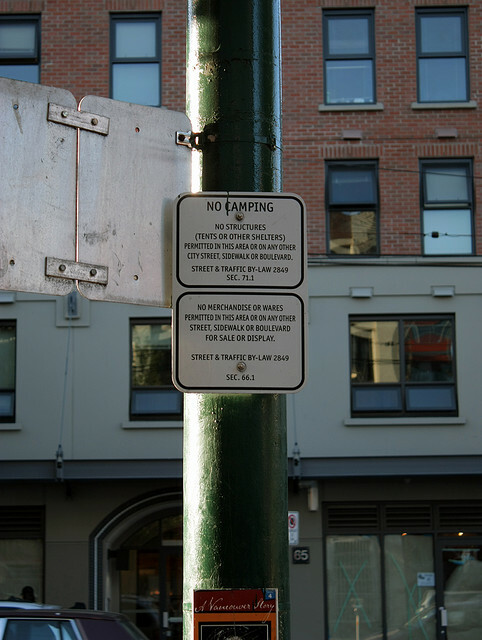 If the protest begins to highlight the practices of Vancouver’s city-elite, the city’s Encampment Committee will interpret the structures by-law as applying to the VAG and will activate its repressive side. Throughout the past three years the VPD have proven themselves to be the “service representatives” for the criminalization of dissent in those instances where the interests of the 1% are brought into question. Whether it has been at the Olympic Village in 2011; the last week of the tent city at 58 West Hasting in February 2010; the forcible clearing of the Granville shelter last Spring; the ruthless arrests at the closing of the Fraser & Broadway shelter on April 29, 2011, or the daily humiliation of the poor, the police have not been preparing themselves to ally with the occupy movement. It is for this reason that, when building a space of justice at a distance from the city-state, we the people will make our way by protecting the sites we construct ourselves, autonomously and without permission of the 1 percent. Posted in #occupyvancouver, Analysis, Police, Public Expression. Bookmark the permalink. When you clashed with the policemen at Valle Giulia, I sympathized for them. Because policemen are children of the poor.